Overnight, the fire remained active in the brush and timber litter, which allowed the fire to make short runs and smolder throughout the night. 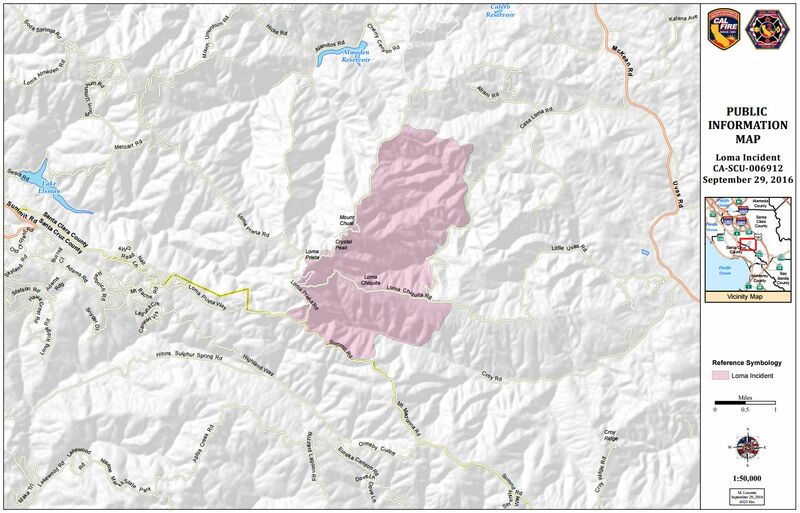 The fire is burning in steep inaccessible terrain covered by drought stressed fuels, burning in the Mt Loma Prieta, Mt Chual and Uvas Creek drainages. Tonight at 7:00PM a community meeting will be held at Loma Prieta Elementary School, located at 23800 Summit Road, Los Gatos. Santa Clara County: Mandatory evacuation orders for the Loma Prieta ridgeline area including all tributary roads along Summit Road from Soquel San Jose Road to Ormsby Fire Station. This includes Uvas Canyon County Park, Loma Chiquita, Casa Loma, and Loma Prieta Way. Portions of Croy Road are under an evacuation warning. Loma Chiquita Road Summit Road from Soquel San Jose Road to Pole Line Road Casa Loma Road at McKean/Uvas Mount Madonna at Ormsby Road Mount Bache Road at Highland Road is open to residents only. Mount Madonna Road at Pole Line Road Croy Road at Uvas Road is open to residents only.